An inviting, laid-back harbor town sitting a stone’s throw from the border with France and about half an hour from wonderful gourmet San Sebastian, Hondarribia is a popular seaside destination thanks to its charmingly well-preserved old quarter and its French-flavored appeal. A modest resort on the Guipúzcoan Coast, this Basque town boasts several lovely beaches, although it’s better known for its historic quarter. Here, twisted cobblestone alleys are lined with ornate churches, shady plazas and stately colorful manor houses whose balconies overflow with flowers. This storybook knot of a town center is enclosed by sturdy 15th-century defense walls set up to protect the town from frequent attacks by the French. The original gateway, the Puerta de Santa Maria, is still the main point of entry into historic Hondarribia. Sitting at the mouth of the Río Bidasoa, Hondarribia faces directly toward France, which sits on the other side of the Bay. As the defensive walls attest, relations between the two neighbors were not always smooth, although these days the only people marching across the border are troops of day trippers. Most head toward the Kale Nagusia (Calle Mayor, or Main Street), which cuts through the casco histórico (historic center), where you will find must-see sights like the elaborate church Nuestra Señora de la Asunción y del Manzano or the Palacio de Carlos V, a 16th-century palace built atop a 10th-century base and now converted into an elegant hotel. The waterfront is equally enticing, with a string of old-fashioned bars and seafood restaurants and a lovely view of the ports. The town’s main beach, the Playa de Hondarribia, stretches 800 meters along the coast and is a popular place in fine weather. Strolling along the Paseo Ramón Iribarren, a promenade that links La Marina fishermen’s quarter with the fishing port is the ideal way to wind down the day. 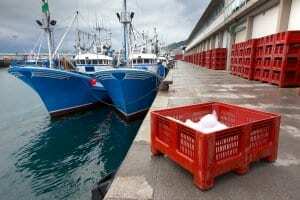 A visit to Hondarribia is a must do if you are visiting Spain’s Basque Lands and nearby Rioja and Navarra wine country. The Basque Country is known for its excellent cuisine, and Hondarribia is no exception. As a seaport, expect to find seafood and shellfish in abundance. The restaurants in La Marina, the fishermen’s quarter, are especially renowned. One of the town’s most famous restaurants is Sebastián, widely considered one of Euskadi’s very best. The simple décor deceives, and you will be surprised by the wonderfully fresh ingredients, traditional recipes, and seasonal dishes. Pinchos, small bite-size tapas made with everything from veggies to meat to cheese to seafood, are popular throughout the region. In October, Hondarribia hosts an annual pincho competition, where local and regional chefs try to outdo one another with creative pincho presentations and taste combinations. Also seek out the sidrerías, traditional taverns where customers help themselves to the hard cider that spouts from enormous wooden barrels. Wines from nearby Navarra are the perfect accompaniment to the regional cuisine, whether you’re dining on just-caught seafood, informal pinchos or regional specialties like codfish. Navarra’s wide range of soils and climatic conditions makes it possible to grow many different grape varieties here, resulting in a broad array of delicious wines. The region is particularly well known for its fruity rosé wines (many made with Garnacha), its rich and long-aged Tempranillos, and its elegant Chardonnays. Also look out for wines made from the regional white grape Viura, and the red varieties of Graciano and Mazuelo. International varieties including Merlot and Garnacha Blanca are grown as well. Rioja is close as well, and you will see all the best Rioja wine labels in restaurants here such as Marques de Riscal, Remirez de Ganuza, Rioja Alta, and more. Also popular are Basque Chacolís/ Txakolis, most of which come from the official Chacolí/ Txakoli regions: Chacolí de Vizcaya, Chacolí de Alava and Chacolí de Getaria (the latter is very near Hondarribia). This light and easily drinkable white wine are served oxygenated, making it seem slightly sparkling. It pairs very well with tapas and pinchos. One of the best Txakolis is from the Talai Berri estate. The original 15th-century gate of the defensive walls that encircle the city, this beautiful stone puerta ushers you into the old city. The town’s most famous church, this largely Baroque creation soars above the clustered buildings of the old city. Now a Parador state-run hotel, this elegant castle-palace complex (which traces its roots to the 10th century and was built largely in the 16th) dominates Hondarribia from its perch at the peak of the town. One of the town’s main squares, this ornate plaza is a pretty, quiet spot ringed by historic buildings. The old fishermen’s quarter, this is a lively seafront neighborhood where you will find atmospheric bars and great seafood restaurants overlooking the water. A cove near the new port houses the ruins of a Roman ship and anchorage. North of town are many excellent beaches, like the Playa de Hondarribia, that are ideal for soaking up the sun. Just six miles south of Hondarribia is this small chapel sitting on a hill. From the top, enjoy panoramic views over the coast and countryside.